The LHC is a circular particle accelerator with a circumference of 17 miles—or about 300 football fields—buried deep underground at the French-Swiss border outside Geneva. Built at the European Organization for Nuclear Research, known as CERN, the collider will smash protons into each other at nearly the speed of light, hoping to produce data that will let scientists see the conditions of the cosmos a fraction of a second after the big bang. Researchers hope it will also find evidence of the hypothesized (but never observed) Higgs boson, nicknamed the “God particle,” which would help physicists explain how particles get their mass and give them a deeper, unified understanding of the universe. Before long, there’ll be proton smashing, but for now, and for the next month or so, scientists will circulate protons in one direction only. Then, they’ll circulate them in the opposite direction. And finally, they’ll crash the protons into each other, analyzing the collisions. According to a new study released by the Center for Theology and the Natural Sciences, most religious believers would welcome meeting and interacting with extraterrestrials. 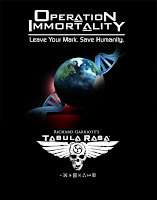 The “Peters ETI Religious Crisis Survey of 2008,” led by systematic theologian Ted Peters, was designed to test the idea that the discovery of an extraterrestrial civilization of intelligent beings would lead to a crisis of faith for religious believers and possibly a collapse of religious traditions altogether. Notably, nonreligious respondents were more likely to predict a crisis for religious belief systems as a whole than were religious respondents themselves. 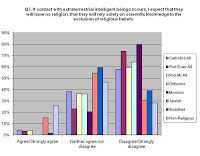 Also interesting is that only about 25 percent of those who identify as nonreligious said they expect aliens to have no religion and to rely exclusively on scientific knowledge.